Featuring a unique blend of delicate mythology and pulse-pounding action, Crouching Tiger, Hidden Dragon featured choreographed fight scenes that looked more like a ballet than a street brawl. 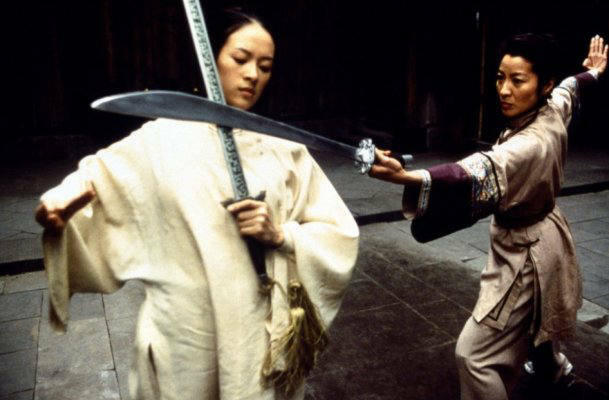 And the best example of Ang Lee's unique vision for the film was the majestic cat-fight between Zhang Ziyi and Michelle Yeoh. With a flurry of ancient weapons, sparks, and estrogen, this was not only one of the most sophisticated fights in the history of cinema, but it was also one of the most mesmerizing. The movements of these two women are simply unlike anything else to ever be put on the big screen, and it also doesn't hurt that they are simply gorgeous to look at as well. With a perfect combination of violence and beauty, this girl-on-girl fight is tough to top.